Remember this name: Goh Weining. For this Singapore Sports School hurdler could well become the new owner of the national girls Under-17 100m hurdles record next year. The 14-year-old Secondary Two student – who set a new C Division 80m hurdles record (12.52sec) at the 49th National Schools Track and Field Championships earlier this month – gave a glimpse of that possibility yesterday when she clocked a stunning 15.51sec to win the Girls U-14 100m hurdles final at the 11th Thailand Sports School Games in Khon Kaen. Although the time is 0.16sec slower than Noreen Herman’s yet-to-be-ratified national U-17 record 15.35sec (which was set at the 49th National Schools Track and Field Championships), the fact remains that Weining is two years younger than her 16-year-old Sports School schoolmate. Weining’s new personal best also sets up a healthy and potentially exciting triple-threat jostle for the ownership of the national U-17 girls mark next year. This is because St Nicholas Girls student Inez Leong, 16, is also another potential record-breaker. Of course, such a mouth-watering clash of the titans can only take place if Noreen and Inez are still competing in the U-17 category when the next edition of the Singapore Juniors rolls around next year. Weining’s gold was one of two track titles that the Sports School won on the first day of the athletics competition at the Thailand Sports School Games. The other was won by new sprint sensation T. Piriyah in the Girls U-16 400m. What is interesting about Piriyah’s time of 58.29sec is that even though it is more than a second off her sensational personal best of 57.11sec (which she set at the National Schools Championships and which is pending ratification as a new national U-17 mark), it is still the second fastest 400m time clocked by a Singapore runner this year. The Sports School also won silvers in the Boys U-16 400m (Jamie Coates in 50.08sec), Boys U-16 4x100m relay (Dennis Lim, Jamie Coates, Jared Lim and Anuar Shahrir, 42.70sec) and Boys U-14 4x100m relay (Luqman Zamrot, Vivekanand, Seamus Shi and Nicholas Tang, 45.15sec). Meanwhile, national triple jump record holder Mariam Shazana could only manage a bronze in the Girls U-17 final after she leapt 11.30m. The distance is 0.29m off her national mark of 11.57m. Sports School’s other bronze came from the quartet of Nurul Sakinah, Lim Ying Jia, Valerie Loo and Habibah Najihahbi. You can find a report on the Sports School at the 11th Thailand Sports School Games here. Disappointed national triple jumper Stefan Tseng has vowed to make amends for his nightmarish outing at the recent 12th IAAF World Junior Championships – by pledging to break the 16-metre barrier and set his seventh national record at this October’s Commonwealth Youth Championships in Pune India. In an interview with the Singapore Sports Fan just a day after his gruelling 28-hour flight back from Bydgosczc, Poland, where the world meet was held, the 17-year-old revealed his distress over failing to qualify for the triple jump final after faulting all three of his jumps. After setting a new national record, his sixth, at the Asian Junior Championships in Jakarta a week before the World Juniors, Stefan had been touted as an outside chance for a medal at Bydgosczc. Instead, when the time came to perform on the world stage, he could not even advance past the qualifying rounds. “It is definitely the biggest disappointment of my jumping career,” said Stefan who had leapt 15.78m at Jakarta. “It was the first time I had ever faulted all my jumps in a competition. Stefan did receive some comforting words from his coach, Dr Valeri Obidko. He said: “Coach told me that s*** like this can and does happen to everyone. “Even the great pole vaulter Sergei Bubka recorded a “no measure” once at the Olympics. However, the fact remains that Stefan was not 100 percent fit when the World Juniors came around. Although he had been sent to Frankfurt, Germany, by the Singapore Athletics Association for a month-long training stint as part of his final preparations for the World Championships, Stefan was never able to shake off an ankle injury which he had picked up at the Asian Juniors. “It was a sprain in my right ankle and that affected me because I use that ankle for my hop and step,” he said. “Because of the injury, I couldn’t do my jumps at training. Instead, I could only do light training to maintain my fitness and spent a lot of time seeking ultrasound treatment for my ankle. In fact, Stefan only managed to resume full training just five days before the world meet. Even then, he was still experiencing a wincing pain in his ankle. 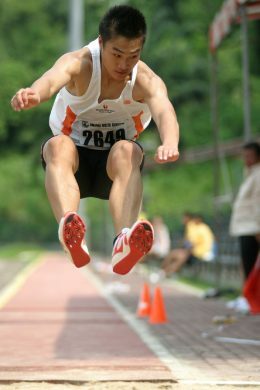 Still, the Singapore Sports School graduate did think he was going to be fine after his first jump during his event, even though it was a fault. “I overstepped by one centimentre but I still managed to jump over 16m,” he recalled. “So when my second jump came, I started from further back so that I wouldn’t overstep again. And then it happened. As Stefan made his hop during his third and final qualifying jump, he lost his balance and couldn’t complete his jump. And with that, all his World Juniors dream came crashing down. It’s been four days since that personal disaster and Stefan feels that he has more or less recovered from his bitter disappointment. However, he is fiercely determined to make amends for his dismal showing. And he plans to do it at the Commonwealth Youth Championships in Pune, India, in October. How? By breaking the national record for the seventh time in his career and by crossing the 16-metre mark. “It will be my way of saying sorry to the SAA because they did put in a lot of money to send me to Germany. I hope I can pay them back with a good result at the Commonwealth Youth Games, which will be my next and final major competition for the year,” said Stefan who will skip the upcoming Singapore Open so as to completely recover from his ankle injury. National jumper Stefan Tseng suffered one of the biggest disappointments in his fledgling career when he failed to qualify for the triple jump final at the 12th IAAF World Junior Championships in Bydgoszcz, Poland, this morning ( about 4pm, Singapore time). The national record holder finished last in the 13-strong qualifying field after recording a “No measure” in all three jumps. He overstepped the line on his first two attempts and then saw his World Junior Championships dreams come to an end when he lost his balance during his final attempt. Six jumpers qualified in all: Henry Franye (Australia, 16.40m), Teddy Tanqho (France, 16.30m), Daniele Greco (Italy, 15.79m), Sheryf El-Sheryf (Ukraine, 15.67m), Christian Taylor (USA, 15.67m) and Jose Alfonso Palomanes (Spain, 15.58m). One wonders whether the persistent pain in Stefan’s ankle (see previous post here), which had bothered him for two weeks after the Asian Junior Athletics Championships, had a part to play in his disappointing afternoon today. 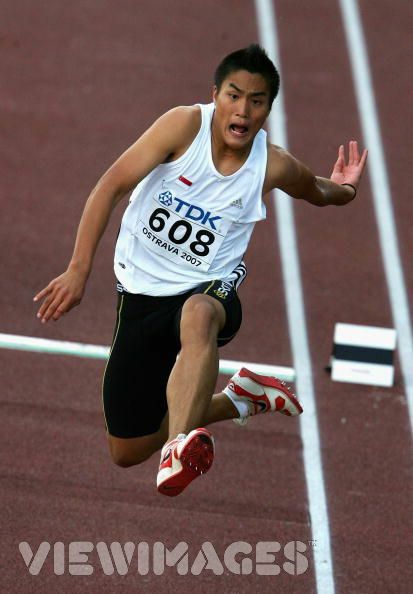 It had affected his performance at the Bahaus Junioren Gala 2008 in Mannheim, Germany, on 21 June, causing him to only manage a distance of 15.20m, a far cry from the new national mark of 15.78m which he set at the Asian Juniors in Jakarta, the previous week. Subsequently, the 17-year-old spent the next two weeks shrugging off the pain and doing only light training before finally resuming full training last weekend. However, every dark cloud has a silver lining and the Singapore Sports Fan feels that if there is one positive that Stefan can take back from his World Juniors experience, it is the indication that he has what it takes to jump 16m. That sign was revealed on his first jump. Even though Stefan overstepped by a mere centimetre, he was able to hurl himself over the 16m mark. Today’s result means that despite spending a month training in Frankfurt, Germany, as part of their final preparations for the World Juniors, both Stefan and Calvin Kang will now return to Singapore empty-handed. On Tuesday, national sprinter Calvin – who holds the national 100m junior record of 10.53sec – reached the 100m semi-finals after clocking 10.62sec in the heats. He finished joint-13th out of 24 qualifiers. However, he failed to make the final-eight cut after finishing seventh in his semi-final in 10.75sec. Calvin’s next major international assignment will be next month’s Beijing Olympics. He has been selected by the Singapore Athletics Association as a wildcard entry for the 100m. Following that, he and Stefan will represent Singapore at the Commonwealth Youth Games in Pune, India, in October. The Singapore Sports Fan hopes that the two young rising talents will grow stronger from their respective setbacks and that they will use this experience to spur themselves on to faster times and longer distances.